Yes, the look of metal against stone has a certain elegant, yet masculine modern feel to it, appealing to all design preferences making it one of the most preferable choices. Designers certainly deserve credit for pair the two materials together as a decorative feature within a space. However, some designers do not always consider the functionality of such designs. Metal is a material that can and will rust. When placed in humid conditions like a bathroom, that is exactly what is going to happen. Suddenly, that beautifully decorated space has become a damp corroded place you wouldn’t want to wash your dog in! Metal is a great building material. Its durability is uncontested. Yet, when using this material as a decorative feature, certain measures must be taken. Depending where metal is being installed—in this case, the bathroom—the material must be pre-treated. It must be properly coated to withstand the water and humidity, just as if metal were being conditioned to outside elements. The issue with pre-treating any type of building material is that it will most likely need to be treated again. If metal doesn’t receive a consistent treatment, it will start to rust. With metal, once it starts rusting and corroding away, there’s nothing more that can be done to save the material. Take the Golden Gate Bridge in San Francisco, for example. Although this monstrosity of a construction is not pure metal, but steel, it is a type of building material that will deteriorate if not properly maintained. According to the Golden Gate Bridge Highway & Transportation District, “Painting the Bridge is an ongoing task and a primary maintenance job” to protect it from the high salt content in the air that can cause the steel to erode. Your metal soap shelf is no Golden Gate Bridge, but the same concept applies. You may not need to paint your metal soap shelf, but trust that in time, it will start to corrode. Because these little features are relatively inexpensive, the best thing to do is just replace it, but that will cost money and the holes drilled in your bathroom wall can only take so much tampering. Those holes will eventually loosen; rendering instability to the overall area that will eliminate the purpose of the soap shelf, storage. With stone soap shelving, all of the above-mentioned issues disappear. There’s no excessive maintenance other than the routine cleaning a tub/shower requires. Also, you will never have to worry about replacement costs nor drilling holes in to your beautiful tile walls. Stone soap shelving is durable enough to hold more than soap. It is cemented securely against the wall. They are perfect for holding shampoos, large body wash containers, shaving creams, razors, and other accessories. Just because stone soap shelving can easily blend in with any existing stone doesn’t mean that the space will no longer ‘pop’ like metal soap shelves can. You can have the durable quality that a soap shelf brings and still present that wow factor that can appeal to clients who prefer the unisex décor. Travertine is a type of stone that can be seamlessly installed as a shelving feature. It is a type of limestone developed from mineral springs—mostly hot springs. It is a stone that can be quite porous depending on the temperature of the heat from the springs. So it is perfect for draining and wouldn’t hold pools of water like a metal soap dish can. Travertine has a fibrous look to it, similar to the rings of a tree trunk, giving it a rustic texture that will bring another layer of dimension into a space. This sedimentary stone comes in colors of ivory, creams, tans, andselect shades of rust. It’s called a Travertine Corner Soap Shelf, but it not just for soap—or the bathroom either. Travertine is a beautiful stone. It can be shown off as a shelving feature by the vanity to store perfumes, toothbrushes, and other toiletries that you’d rather not stuff away in a drawer. These stone soap shelves are also perfect for featuring awards, plaques, heirlooms, and trinkets in an office setting or in a living or dining space. For builders and contractors, stocking Travertine Corner Soap Shelves would be a profitable investment. This feature would be an easy add-on and doesn’t take up much space in a warehouse. Stonexchange offers Travertine Corner Soap Shelves in crates of 100. They measure 9” in radius with a beveled edge for safety. We also offer stone soap shelves in Carrara, Ivory, Walnut, Crema Marfil, Pure White, and Absolute Black. In addition to the stone soap shelf, we also offer Travertine Shower Seats. 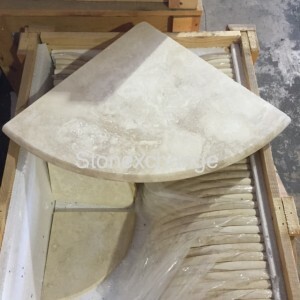 If you are looking for a wholesale company where you can find Travertine Corner Soap Shelves at a decent price, call Stonexchange today at 305-731-2400 to discuss how far your dollar can go with us. Our unit prices are fair and affordable. So get started on increasing your sales by stocking Travertine Corner Soap Shelves. Our customer service department is ready and available to answer any questions you might have.You can also view our online catalog and contact us online.